Are there times when you wish your nose were different? The nose sits on the center of the face, and it often attracts more attention than anything on the face. Let’s say that your nose is not as attractive as you would like, but that can always be solved with a bit of make-up techniques. What if you have an injury or medical condition around your nasal area that prevents you from functioning normally? Whatever your reason—whether it is aesthetic or truly medical—rhinoplasty is your best bet. Rhinoplasty—or in simpler terms, a nose job—is a plastic surgery procedure designed for correcting and reconstructing the nose. The procedure can also be done to restore the functions of the nose, as well as enhancing the nose for aesthetic purposes. Rhinoplasty can involve the resolution of past nasal trauma (could be of the blunt, penetrating, or blast variety), respiratory impediment, congenital defect, or the effects of a failed nose job in the past. Fixing the nose can drastically change the appearance of many people.Our head plastic surgeon, Dr. Arturo Gonzalez, is one of the best surgeons in Tijuana for this procedure. 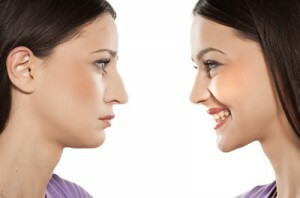 There are two basic kinds of rhinoplasty surgery—closed rhinoplasty or open rhinoplasty. Three kinds of medical professionals can perform the procedure. A plastic surgeon, an otolaryngologist (a specialist for the ear, nose, and throat), or a maxillofacial surgeon (a specialist for the jaw, face, and neck) will create a functional and facially proportionate nose for the patient. This is done by the separation of the nasal skin and the soft tissues from the osseo-cartilaginous framework that supports the nose. The skin and soft tissues are corrected (as required) for both form and function, and then the incisions made are sutured before a stent or a package (sometimes, both) to make sure that the corrected nose will not move or be disturbed, and eventually, to facilitate the proper healing of the area. A nose job does not always involve incisions and surgeons. Non-surgical rhinoplasty is a great alternative for those who want aesthetic correction for their noses without invasive surgery. Non-surgical nose jobs involve injectable fillers, typically ones consisting of hyaluronic acid (such as calcium hydroxyapatite, Restylane, and Juvederm). This type of procedure fills in the depressed areason the nose, lifting the angle of the nose tip, or smoothing the bumps on the nose bridge. Essentially, non-surgical rhinoplasty is an augmentation procedure—it cannot be performed on someone who wants to reduce the size of his or her nose. Aside from having a more beautiful face, patients who undergo rhinoplasty can also expect to breathe easier and sleep better at night. In the United States, the cost of rhinoplasty is determined by a lot of factors, including the techniques used for the procedure. If you want to have a nose job in the US, make sure that you have prepared $7,000 to $12,000 to keep all your bases covered. But at Samaritan, the price is just a fraction of what you would pay at home.